A QE boy’s correct answer to an outlandish numerical and scientific challenge won him a prize during a show aimed at inspiring young mathematicians. Aryan Shrivastava correctly calculated that 7.5 million tins of Alphabetti Spaghetti would be needed to list the entire human genome, netting him a signed copy of Helen Pilcher’s book, Bring Back the King, which looks at the science that makes the resurrection of extinct animals a real possibility. 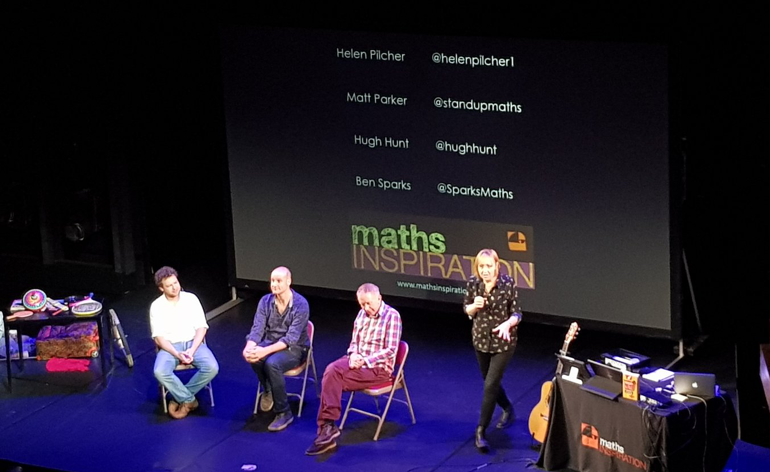 Helen, a scientist, comedian and writer for the science magazine, Nature, was the host for The Maths Inspiration Show at London’s Piccadilly Theatre, which was attended by around 60 Year 11 boys from QE. She explored the distribution of letters found in a tin of Alphabetti Spaghetti. Her hypothesis was that there should be a strong correlation between the letters found in a tin and the occurrence of letters in the English language. In fact, the scatter graph she produced showed no correlation, nor did others for different languages, reported Mathematics teacher Phillip Brady. 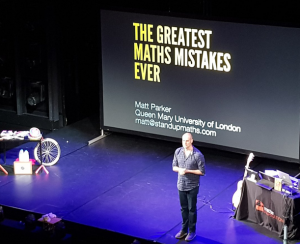 Matt Parker, who describes himself as a “stand-up mathematician”, related some of the mathematical errors set out in his book, Humble Pi. Some, he said, were simply amusing or embarrassing, such as McDonalds miscounting the combinations of meal deals and Pepsi underestimating the value of a fighter plane. However, he pointed out that some other mistakes he had come across could have more serious consequences, such as an aeroplane running out of fuel because the wrong units had been used to fill the tanks. Afterwards, the pupils reflected on their favourite speakers of the day. Priyan Solanki said: “Hugh Hunt’s demonstration of the gyroscopic precession was very interesting.” (Precession is a change in the orientation of the rotational axis of a rotating body.) Harrishan Kangatheepan enjoyed Matt Parker’s explanation of how our minds can deceive us, especially with enormous numbers such as a trillion, while Ridwan Khan’s interest was piqued by Ben Sparks, from whom he learned aspects of probability that were new to him.